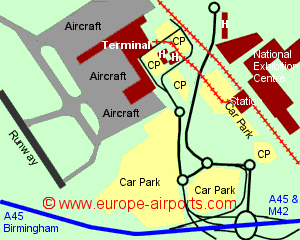 Birmingham Airport is located 13Km South East of Birmingham, next to the National Exhibition Centre, close to the M42 and M6 motorways giving good access to a large part of England. Previously having two interconnecting terminals, Birmingham airport has now combined these into one with a single security area, improving overall efficiency. A free monorail link operates between Birminham International Station and the airport, with a journey time of 2 minutes. Bus services between the airport and Birmingham cost approximately 2 pounds and taxis are available. National Express bus services include Birmingham (from 4 pounds), Heathrow (from 30 pounds), Luton airport (from 18 pounds), Stansted airport (from 27 pounds). Rapid drop-off car parking is available near the terminals and short stay car parking is in multi-story car parks near the terminals. Birmingham airport has 13 bars/restaurants, 25 shops, 8 ATM's, 4 currency exchange facilities, 4 business lounges, Internet access points, and FREE WiFi Internet access. The 3 star Novotel is located immediately opposite terminal 1. A Travelodge is also located on site. Birmingham airport handled 12.9 million passengers in 2017, an increase from the previous year of 11%, and keeping it the 7th busiest in the UK.